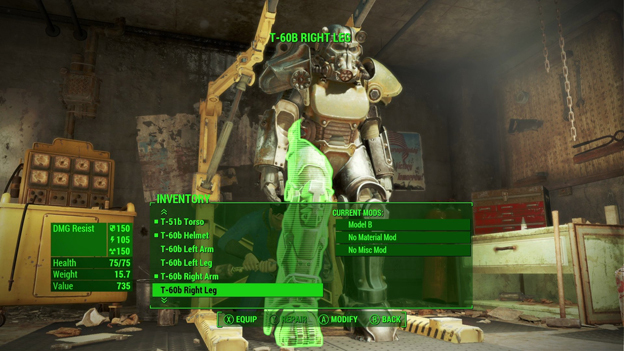 The best new addition to Fallout 4 is the crafting and building system, which allows you to mod your weapons and armor, as well as build up settlements that will then support you on your journey. You can build freely inside any pre-set building zone (mostly settlements removed from the city center), doing anything from creating your dream post-nuclear shanty-palace to a fort guarded by nasty traps and turrets. All the item collection you'll want to do for these systems requires an awful lot of back-and-forth due to inventory weight limits, though at least all your workshop inventories are linked. 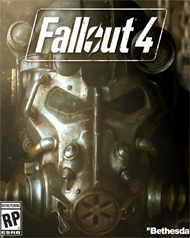 As with all the menu interfaces in the game, the building and workshop interfaces could be better, but in general this is one of the best improvements over Fallout 3, and one of the few systems in the game that is up to par with the competition. Maybe I'm being too critical – fans who started out the series with Fallout 3 will find more of the things they loved about that game, with a slightly prettier wrapping and even more wacky things to discover. There's plenty of fun to be had if you're willing to ignore the thematic oddness and out-of-date design decisions. I, however, feel like we've given Bethesda a free pass on certain game elements for too long because it was once the only big company making these types of games. That's no longer the case, however. Over the past few years I've enjoyed the strong cover system in Deus Ex: Human Revolution, the deliriously fun action combat of Kingdoms of Amalur: Reckoning, the ever-improving open-world traversal systems in Assassin's Creed, the delightfully responsive shooter controls in Destiny, and the narrative and world-building excellence found in The Witcher 3. I've got higher expectations for presentation and gameplay these days, expectations that Fallout 4 falls short of in almost every respect. Improved textures and effects, but largely the same old stiff animations and major clipping issues. Awkward movement, no cover system, glitchy combat, and a poor interface make interacting with the world of Fallout 4 a tedious affair compared to other games of its class. The music is great, but we've heard it before. Other than the main character, the voices are more accents than characters. As always, there's a ton of Wasteland to conquer and interesting things to discover, provided you're down with the outdated gameplay systems. FREEDOM AND LIBERTY: Do whatever you want in a massive open world with hundreds of locations, characters, and quests. Join multiple factions vying for power or go it alone, the choices are all yours.